Dutch regulations have implemented Extended Producer Responsibility (EPR) for a variety of products and waste streams. EPR means that producers become responsible, in a financial or operational way, for the end-of-life stage of products sold to consumers. Commissioned by the Dutch Ministry of Infrastructure and Environment, EY Climate Change and Sustainability (CcaSS) explored how Extended Producer Responsibility (EPR) in the Netherlands can be further enhanced with respect to eco-design and the circular economy. The Netherlands are aiming to sustain their leading role in the transition towards the circular economy. The circular economy aspires to transform the typical linear economic model in which resources are extracted, consumed and disposed to a circular model where resources are used in closed circles. Commissioned by the Dutch Ministry of Infrastructure and Environment, EY Climate Change and Sustainability (CcaSS) explored how Extended Producer Responsibility (EPR) in the Netherlands can be further enhanced with respect to eco-design and the circular economy. The results are used as input for the new National Waste Plan (LAP3) and the government-wide Circular Economy program (Rijksbrede programma Circulaire Economie) that will be presented to the Dutch Parliament in October 2016. 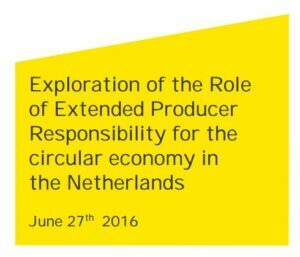 Policy makers in the Netherlands and elsewhere are looking into different options to foster the circular economy. Taking into account the proven effectiveness of Extended Producer Responsibility (EPR) with respect to collection and recycling of waste, the instrument may also offer significant potential for other circular economy aspects. The report draws upon insights of international literature and a review of EPR schemes in France, Belgium (Flanders) and the Netherlands. Also, insights from other countries were used and key Dutch stakeholders have contributed to this report by giving their reflection on the identified pathways. This report identifies several key pathways to use EPR for the transition to a circular economy, like extending EPR to new product groups and strengthen financial incentives. In order to transform the insights into policies, additional economic and environmental analysis as well as stakeholder consultations are needed. The study was executed by the EY CCaSS teams of Belgium and The Netherlands. 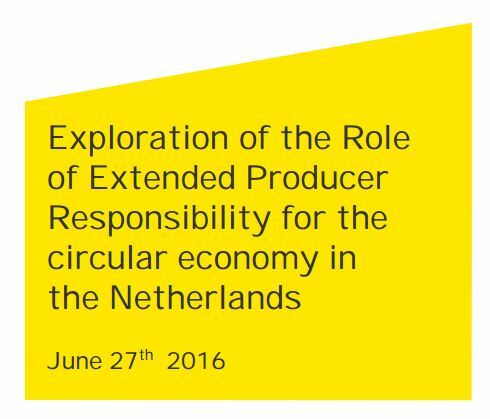 Hey Buddy!, I found this information for you: "Can Extended Producer Responsibility support the transition to a Circular Economy?". Here is the website link: https://www.duurzaam-ondernemen.nl/can-extended-producer-responsibility-support-transition-circular-economy/. Thank you.